Since Hentie van der Merwe discovered the fountain in the Valley, Henties Bay was renowned for its abundance in fish and fishermen flocked to this magical spot to share in the riches the sea so generously offered. In those years Hentie and his friends did not have fancy angling gear – they used a hand line secured to a stick, a piece of chain for a sinker and nails for hooks. Red bait and mussels were as plentiful as fish. Today fishing is still great fun and more and more fishermen flock to Henties Bay to partake in this popular sport. The main attraction is not only the fish, but the wide open beaches where serious anglers with their 4×4 vehicles are heartily welcomed and where the whole family can enjoy endless days on the beach. Refer to Angling Spots & Routes for more information and book one of our registered and capable activity operators to make the best of your fishing experience. They do daily trips as well as longer excursions to the Skeleton Coast. Shark angling is one of the most popular activities presented by Activity Operators in Henties Bay and it attracts many overseas anglers to Henties Bay each year. 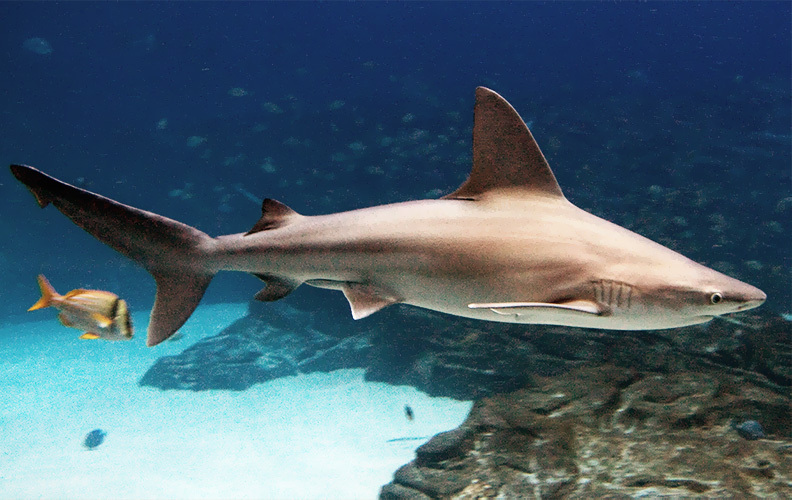 The copper shark or bronzy can reach a weight of up to 190kg and certainly gives you worth for your money! Spotties, cow sharks and hound sharks are other species you are likely to hook. Namibia is one of the few countries in the world following a national action plan for the conservation of shark species. No shark may be taken for trophy, or be left on the beach. All sharks must be returned to the sea alive and unharmed. Do you want to do some serious angling? Then Henties Bay is just the place. From here you can either go north or south, depending on where the fish are at the day. The beaches are open and accessible to fishermen with 4×4’s. Remember, no angling is allowed within the borders of the Cape Cross Seal Reserve! Well-known angling spots with names like Bennie se rooi lorrie, Popeye, Sarah se gat, Canopy, Blare and many more, are not marked but maps with GPS coordinates are available at the Tourist Information Office. Depending on your bait and the water conditions you are likely to catch edible species such as silver kabeljou, west coast steenbras, galjoen en blacktail (dassie). But make sure you know what the restrictions are (see Angling Regulations) as there are serious penalties for violation of the law! The traditional months for rock and surf angling are from the end of January to April, but serious fishermen believe that you have a good chance right through the year. Get your fishing permit, do not violate the angling regulations, stay on roads and tracks and PLEASE do not litter on our beaches! A violation of the rules of the Dorob Park is subjected to heavy penalties – so please make sure that you have the correct information and stick to the rules. An A2 satellite image angling map with all the routes and angling spots indicated with GPS coordinates is for sale at the Henties Bay Tourism Centre. 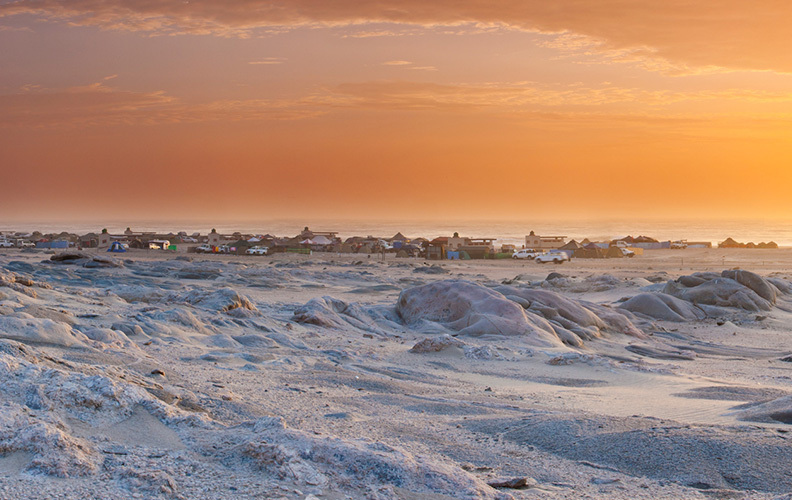 These two angling hotspots are situated in the protected area of the Skeleton Coast Park and are under management of Namibia Wildlife Resorts. Torra Bay is 265 km north of Henties Bay and only open during December and January. There are only camping facilities – no other accommodation. Terrace Bay is situated 316 km north of Henties Bay and open throughout the year. Accommodation consists of chalets on a DB&B basis – there are no camping facilities. You can only visit these two sites if a reservation is made through Namibia Wildlife Resorts and NO day visits are allowed. Angling guides know the coast and the best fishing spots for the day!! !